https://www.carvedlakeart.com/ Check out carvedlakeart if you want the best deals on laser cut map, wood nautical chart, wood topographical map, and charts of the lakes, streams and oceans of the world. Everyone likes to have a stylish and well-decorated home, but going green and reducing carbon footprint is a proactive decision to make. When designing your own space, allow products and style to be in harmony with their surroundings. To even lessen carbon footprint, use local materials or buy from retailers which use recycled materials. Colors are a great source of inspiration, choose a color to paint the exterior of your house, use the same color palette to paint accents corners and blunt spaces in your home. But what could be even better than to reorganize your home and still save some money? Here are some of the best universal tips from interior designers that don’t go out of style. Sunlight naturally brightens up home, it also provides health dose of Vitamin D that keeps bad moods at bay. Homes with natural light effortlessly become a happier place to live. As you harness natural light in, you reduce your monthly electrical bill. Choose window curtains of light color and fabric, these will let more sunlight to penetrate your home in a subtle way. Fill your home with the beauty of nature. There is a lot to choose from the most common edible herb gardens to great blossoming flower pots, choices are limitless. Flowers and shrubs can be easy accents to dull corners of your home. They are also great stress relievers and oxygen bombs which freshen up the air. Plants can also remove most toxic smells in your home and can help to maintain temperature. More designers are making efforts in finding ways to incorporate green spaces into homes. Even in high rise urban areas, vertical gardens are now a common sight. One rule of interior design which every expert follows is to provide a personal touch as much as possible. Love the seas? Incorporate some woodcrafts into your living room and put sands or seashells in the decorated glass. Can’t get enough of family photos? Hang your photographs from your recent and most memorable family vacations. For better presentations frame these pictures to add accents. To bring nature in, without too much hassle of maintaining them, fill vases with the colors of the season like autumn leaves, mistletoes, or summer flowers. For the past few years, elements of nature are the hottest trends of interior design. Anything that connects with nature either natural wood flooring, marble kitchen counters, bamboo accents, even tiny landscapes at home is a trending design of all time. The idea of green space and nature at home offers a space to de-stress. It’s a readily available organic source of calmness and serenity even in tiny urban spaces. Hints of metal accents are a big come back in the last few years. From small brass door accents to elaborate wood and metals wall decorations, there are numerous different choices to pick from. These trends will not fade anytime soon, it’s a fun and most budget-friendly way to spice things up in the house. It will give a more elegant look at a fraction of a cost and a big nod to Mother Nature’s finest works of art. With the minimalistic look on the rise, interior designers are creating functional places in most homes. A wall décor can also be a good work of art as a clock. Or a simple coffee table can be a centerpiece of a conversation starter. When choosing home furnishing, function and style had always dominated the choices. However, with ever changing times, reducing carbon footprint and recycling had been a big thing of the future. Now more than ever, there’s a call to lessen carbon footprint and incorporating Mother Nature into our homes. Different communities learn to design various home fixtures to have multi-use in most homes. Designers are opting to more sustainable elements of design as much as possible. You don’t need fancy and expensive decorations; make use of what really matters – the beauty of nature. Colors of nature make us feel refresh like a paradisal summer vacation, relax like the smell of spring meadows, and long for festive celebrations like the colors of autumn or just stay at home during the coldest of winters. Mother Nature is not just a decoration; it’s the way of life that most of us took for granted. Incorporate that into your home and you would not want to leave it behind. Life is basic and boring if you go to the same places and take the same pictures as everyone else. After all, Columbus wouldn’t be Columbus, ‘The Explorer’, if he had stuck to the same journey as everyone else again and again, right? Beyond the classic cities and landscapes, Scotland can offer so much more. With this 10 wonderful destination alternatives, you can explore the less travelled roads of United Kingdom’s northernmost country and discover the country’s hidden wonders. You can be guaranteed with extreme satisfaction with picturesque villages, ethereal natural beauty, a taste of history with historic buildings, art-filled galleries, as well as excellent local restaurants, just to name a few. 1. Berwickshire is a must-go for quaint coastal town lovers. Traveling to Berwickshire will indeed fulfill your pleasantly-old-fashioned heart. This town, which is nestled in the east of the Tweed Valley Forest Park in the Scottish Borders, is an hour away from Edinburgh, Scotland’s capital. Being a historic county, Berwickshire can offer you a relaxing break from the hectic stress that life and the city offers—there are many great outdoor activities such as diving! While staying here, you can enjoy the beauty of quaint towns and villages, stunning country houses, magnificent birdlife, and beautiful sandy beaches sheltered by high cliffs. Doesn’t that sound remarkable? If you love the glistering lake, or lochs as Scottish people would say, and high mountains, why not try the Cowal Peninsula? Surrounded by Loch Long an Long Fyne in the west of Scotland, the Cowal Peninsula in Argyll and Bute is a place where you can find stunning scenery. The northern part of the Cowal Peninsula is surrounded by the Argyll Forest Park. Furthermore, the area is only a little over an hour, by car, away from Glasgow, where you can find the fascinating Highlands. Those who love the outdoors, food, and wildlife buffs will have the time of their lives in this peninsula. 3. Lanarkshire, the land of beautiful scenery and outdoor pursuits. Although the other places we have mentioned above have spectacular views and outdoor activities, nothing can compare to Lanarkshire. Lanarkshire, also known as the County of Lanark, is a historic county in the central lowlands of Scotland. It is important to note that leaving this place, which is sandwiched between Glasgow and Edinburgh, might be a bit hard to leave. Why? Because Lanarkshire offers an abundance of sights to see and activities to do. A round of gold, fascinating historic buildings, two UNESCO World Heritage sites, what more can you possibly ask for? 4. Love pristine and dramatic scenery? Try the Sutherland and Caithness area. Who doesn’t love pristine and dramatic scenery that looks like it came out of a movie? The Sutherland and Caithness are some of the isolated and least populated parts of the far north of Scotland. However, they offer great amounts of sensational scenery, wonderful wildlife, rich heritage, high mountains, narrow valleys, seascapes, and landscapes. Your holiday in this remote area of Scotland will offer you so much! 5. The small but abundant Cumbrae. The Isle of Cumbrae or Great Cumbrae is the larger and most accessible of the two islands known as The Cumbraes in western Scotland. The untainted coastline is popular amongst visitors who especially love water sports, cycling, walking, and nature. 6. Nothing beats peaceful walking in beautiful scenery, so go ahead and try the Angus Countryside and Glens. If you are one of the many people who enjoy peaceful strolls while enjoying the scenery around you, then the countryside of Angus, which stretches out from the city of Dundee, is the perfect area for you to witness the lush valleys and soft peaks of the Angus Glens. In these areas, you can find endless miles of twisting small roads and paths, which are perfect for walking, cycling, and just enjoying the great outdoors—there are also towns and smaller villages where you are able to experience serenity and interactions with friendly locals. If you love rolling hills and sandy beaches, then Dumfriesshire might be the perfect place for you! The hilly area of Dumfriesshire has a generous mixture of landscapes, undisturbed lochs, woodland to a rocky coastline, as well as sandy coves. Dumfriesshire, or the County of Dumfries, is situated along the shore of Solway Firth and is an outdoor lover’s ideal haven. 8. Next on the list, Banffshire! If you love rugged cliffs and an abundant amount of wildlife, it’s a must to pay a visit to Banffshire. With miles of rocky cliffs, sandy bays, and splendid examples of Georgian architecture, the wonderful corner of northeast Scotland, is full of pure artistry. 9. The Shetland Islands, the wonderful archipelago of Scotland. Being made up of more than 100 islands, there’s so much more to the Shetland Islands than meets the eye. Each island possesses and shows off their own stunning sceneries, unique heritage, and special characters. With every island you visit, you’ll get a taste of their wealthy archaeological and historic sites as well as a diverse array of flora and fauna—which are distinct to the isles. 10. With East Lothian, you are guaranteed pretty seaside villages and beaches. With East Lothian, known for its picturesque countryside and delightful coastline, you’ll never be bored. Although last in the list, with a range of outdoor activities, over 40 miles of coastline, golden beaches, food, some of the world’s finest golf courses, and award-winning attractions, East Lothian is definitely not the least when it comes to wonderful places to visit in Scotland! Scotland, the land of fabled battlefields, Loch Ness Monster, and blaring bagpipes is one country that hides its charms beyond its wildly romantic mountains. It’s a great destination – one that filled with history, Highland cattle, amazing landscapes, and ghostly castles. Scotland has a lot of charming evergreen lush forests and secluded pristine beaches which makes make Scotland unique. What so special about Scotland? A typical tour in Scotland includes epic battlefields where clans fought fiercely against the English and literary trails where Sir Walter Scot and Robbie Burns once trotted. There are spectacular remote purple colored moors and untouched forests all waiting to be explored. If these don’t entice you to visit the country of famous skirted knights, then nothing will. Here are some of the best places in Scotland. https://www.carvedlakeart.com/united-kingdom-wood-nautical-chart-map-p/ukil-d4l.htm Check out carvedlakeart if you want the best deals on laser cut map in Scotland, wood nautical chart, wood topographical map, and charts of the lakes, streams and oceans of the world. To start the Scotland adventure, Isle of Skye ranks at the very top of the list among nature lovers. This place boasts of very beautiful mountain scenery, evergreen forests, and mysterious caves. Known as the “Cloud Island”, it’s the largest inner isles in Scotland. The Isle of Skye, by its Viking name “Sküyo” is famous for its heavy mists that often hide the isle, where majestic waterfalls and pristine beaches are all located in this magnificent isle. The series of clear emerald pools is what makes the Isle of Skye even more attractive to adventure seeker tourists. With just a few miles hike, tourists can continue their adventure into Coire na Creiche which takes them into the majestic Cuillin Mountains without any difficulty. Follow the sign at the forestry car park from Sligachan into Glenbrittle. Located in the city of Inverness all the way to Thurso, the Northern Highlands rests at the northern peak of the Scottish Mainland. This place has the most scenic view; one can be fully enjoyed through riding a bike or by walking on its many trails. There are many picturesque villages and small towns along its skirts which serve as a quick getaway and resting place for the big hike ahead. The most rewarding view one can get is from the coastal town of Dornoch with its cathedral and castle ruins. Extending from Inverness on the east and crossing over to the Corpach near the western coast of Fort William, tourists can find the ancient fault line which gives birth to the Caledonian Canal. 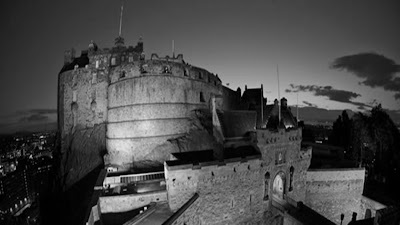 Tourists may encounter several castles while in Scotland, but the Edinburgh Castle is not something they should ignore. It’s most popular fortress in the country and played a very vital role during the reign of King David I during the 12th Century. The castle stands as the most prominent national monument in Scotland. Sitting atop of the extinct volcano, Edinburgh Castle has one of the most spectacular views overlooking Princes Street, Holyroodhouse, Royal Mile, and other notable city landmarks. Its entrance is well guarded by two bronze statues of their national heroes, Robert the Bruce and William Wallace. Both fought viciously and defeated English invaders during the later 13th century until the early 14th century. Tourists are greeted with a grand entrance through a drawbridge which crosses an old moat. The best time to visit the palace is during the month of August when they held the famous Edinburgh Military Tattoo. There’s not a single Harry Potter fan in the world that doesn’t recognize this famous Jacobite Steam Train. Aside from its worldwide famous role, the train pass has a lot of very scenic views. The six-hour return journey which starts at Ben Nevis in Fort William, Glenfinnan Viaduct which was featured in the Harry Potter films, to the Morar before arriving in the fishing port of Mallaig, commuters are well treated with beautiful landscapes and majestic sceneries. For centuries, the Loch Ness monster sparked controversies and many curious urban legend seekers. Many think of Loch Ness as a mythical monster hiding in deep cold waters of secluded lakes. 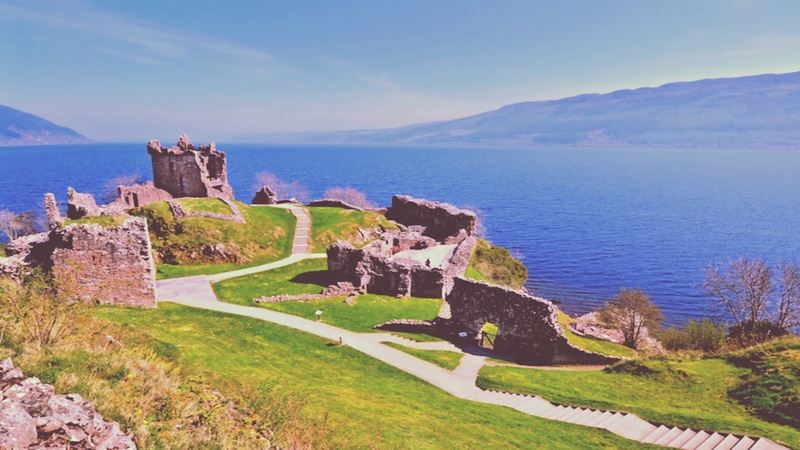 But there’s no place on earth that does better in telling its story, and something proof of the urban legend than Drumnadrochit Hotel’s Loch Ness Exhibition. 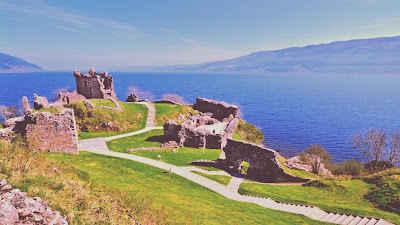 Another favorite tourist destination is the ruins of Urquhart Castle. This much-photographed castle sits on top of land overlooking the loch. With its history and mysterious ambiance makes the Inverness a unique attraction in Scotland. Trossachs National Park is the every anglers dream; plentiful harvests of whitefish, trout, and salmon. Located about 14 miles north of Glasgow, Loch Lomond is considered as Britain’s largest lake. It has the most scenic view for a fisherman, its beautiful mountain slopes and streams will never bore anglers. Many would brave some water activities and hikers love its luscious greeneries. Everyone that’s been to Wales tells the same exact thing, it’s a beautiful country full of luscious greeneries, fairytales like castles and natural drama. There are a lot of fun outdoor activities – from its sandy beaches to its majestic mountain ranges; Wales is one country that literally goes down in the history of humankind. Its stories had been told in many ancient monuments and museums. The bold and the brave, travel to Wales to find its romantic charm captivating. Castles and different monuments are its biggest attractions, while some go in for a more adventurous journey. Wales is a country full of wonderful natural sceneries. Here are some of the most notable castles and grounds to visit in Wales. Built as a military stronghold between 1283 and 1330 and designed by Master James of St. George from Savoy, Caernarfon Castle functions, the Caernarfon Castle was the center of the government and a royal palace. Its ancient walls and tower were extraordinary and remain as one of the most complete and impressive castles in Britain. The charm of the 5th-century architecture of Constantinople in Istanbul still echoes of its color bonded masonry. Its polygonal towers are reminiscent of the ancient tales of the influence of early civilizations. If only walls can talk, the castle can tell much of its many murder plots of the nobles and known heroes of the ancient times. In 1404, it repelled the army of Owain Glyndŵr's with only 28 men. The castle had endured and resisted three sieges during the English Civil War before succumbing to Cromwell’s army in 1646. With such great history and architecture design, Wales had well preserved its beauty, however, empty it may seem. The Eagle Tower remains as the best place to start your journey. Its entrance marked with one flagpole to the right and turrets where you can spot the weathered eagle, where it gets its namesake. Inside there are exhibits about Eleanor of Castile and the Welsh version ‘Game of Thrones’. On the other side the castle known as the Queen’s Tower, you will find Regimental Museum of the Royal Welsh Fusiliers with different exhibits showcasing many uniforms, medals, weapons, and other historical displays. 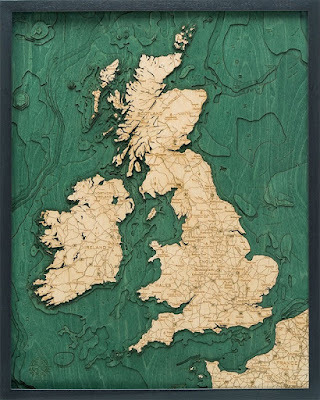 https://www.carvedlakeart.com/united-kingdom-wood-nautical-chart-map-p/ukil-d4l.htm Check out carvedlakeart if you want the best deals on laser cut map in Wales, wood nautical chart, wood topographical map, and charts of the lakes, streams and oceans of the world. Thomas Telford, a Georgian engineer built the Pontcysyllte Aqueduct in 1805 to carry the canal over the River Dee. Measuring about 307 meters long, 3.6m wide, 1.7 meters deep and standing at 38 meters high, this engineering marvel of that time is the highest canal aqueduct ever built on the entire UK. Because of its feat, considering the resources and machinery available at that time, it was listed as a UNESCO World Heritage Site. During 18th-century horse-drawn canal barge was the main mode of transporting goods but it was soon replaced with the introduction of the railway systems. Telford designed the canal to connect haulage routes between River Dee, Severn and Mersey. With these, he even built Horseshoe Falls to gather water for the canal from the River Dee. It used to carry drinking water from River Dee to the Hurleston Reservoir located in Cheshire. Today, its riverbank is a great place to have a picnic and to rest tired feet from all those walking. Visiting this vertigo-inducing canal needs a head for heights, as you can walk in its paths for miles free of charge. There are blue-badge guides that offer guided tours near the aqueduct. You can also find canal boat rides which feature trips along the ‘stream in the sky’. The Great Orme Mines is the largest prehistoric mine ever discovered to date. Located near the top of Great Orme, it has a paved car park for visitors. The place is one of the most recommended places in Wales, wherein the 4,000 years old mine serves as a great important discovery in history. The mines run about 5 miles and were dug for over centuries using only stones and bones in search of copper. There’s a self-guided tour explaining about how rocks turned into copper at the smelting site which can last for about 45 minutes. You can also head further 200 meters down in its 3500-year-old tunnels to learn more about the ancient miners. Hidden behind high walls, St David's Cathedral is virtually invisible to all. Built within a 6th-century chapel, the cathedral dates from 12th to 14th century and emits an air of antiquity and deep historical importance. The unconventional site was chosen to protect the cathedral from Viking raiders, but it was ransacked more than five times. Weathered and in poor condition, Sir George Gilbert Scott made extensive works to stabilize the building. Once you entered the wall, the stone walls of the cathedral come into view. Its beauty and atmosphere emit reminiscent of the ancient times. The cathedral has four pointed ethereal purple stone and a rich carving in its 16-century oak ceiling adorned with pendants.